During class, Connie Payne, Allied Health student at Mesalands, checks the pulse of a human-like simulator. During this month’s Board of Trustee’s meeting, Natalie Gillard, Vice President of Academic Affairs at Mesalands Community College, presented the SUN PATH (Skill Up Network Pathway Acceleration in Technology and Health Care) progress report for October 1, 2014 through September 30, 2018. She stated the SUN PATH consortium has been nationally recognized for their success in the SUN PATH program. In 2014, Mesalands Community College received $537,490 from the Trade Adjustment Assistant Community College and Career Training (TAACCCT) grant, as one New Mexico’s consortium members hosted by Santa Fe Community College. The TAACCCT grant program also aligned with the State of New Mexico’s SUN PATH initiative to expand and improve the delivery of healthcare career pathways, to increase graduation rates, and align educational requirements with employer’s needs, in order to improve employment outcomes. After four years in SUN PATH, Mesalands reestablished the Nurse’s Aide Certificate and expanded their Allied Health course offerings, to include an Associate of Applied Science Degree in Allied Health and an Occupational Certificate in Phlebotomy. 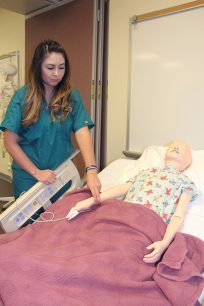 This program also provided students in the Allied Health Program with access to state-of-the-art simulation equipment and various computer programs. According to the progress report, Mesalands had a total of 100 students enrolled in various Allied Health courses. Altogether, 62 students completed their studies (many are still retained in their program of study), while earning 74 certificates, degrees, and industry recognized credentials. Incomes for 55 students also increased during or after their studies. Diaz obtained an Occupational Certificate in Nurse’s Aide and Phlebotomy from Mesalands. The SUN PATH Progress Report also outlined the impact this program had on the local community. The Emergency Medical Technician Basic Certificate Program was offered to meet workforce needs in Quay County and surrounding areas. Adult Education (AE) and pre-collegiate students now have access to credit bearing training programs leading to industry certification and employment through the Nurse’s Aide, Phlebotomy and EMT-Basic Education and Skills Training (I-BEST) Program. In addition, the College has 12 healthcare employer partners that are actively involved in attending Regional Council Meetings and providing clinical and job placement for students. Gillard also announced Mesalands is working on seeking approval to expand their Allied Health offerings to Licensed Practical Nurse (LPN) and Registered Nurse (RN) programs.